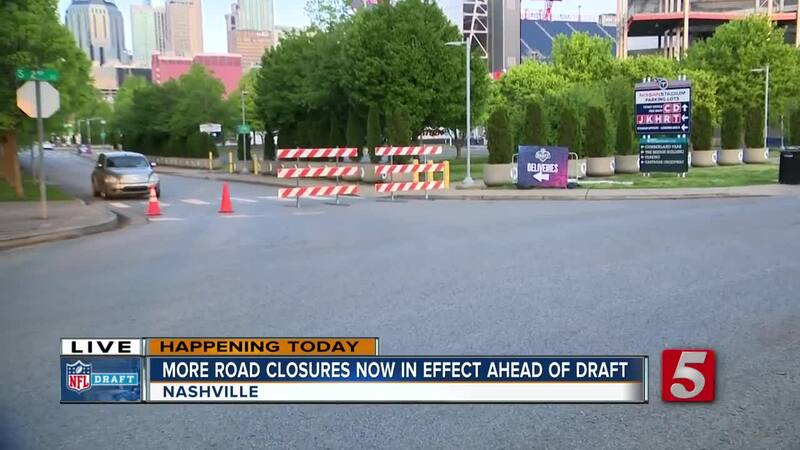 NASHVILLE, Tenn. (WTVF) — With just 10 days to go before the NFL Draft in Nashville, more downtown road closures just went into effect. Titans Way will be closed from Russell Street to Victory Avenue. Victory Avenue will be shut down from Titans Way to South 2nd Street. 1st street will be closed from Victory Avenue to South 2nd Street. Now these aren't the only closures people need to watch out for this week. On Wednesday, Broadway will be partially closed at 5th Avenue and will fully close from 5th to 6th Avenues on Friday. Riverfront Station will also be closed until April 23. Anyone who uses the Music City Star will have to catch a ride from a temporary location under the nearby pedestrian bridge. The NFL Draft is expected to have a profound economic impact and bring an estimated 300,000 people to Music City.